Celebrate the 4th of July with your own copy of my American Bald Eagle eBook! Celebration price of $9.99 (regular $12.99) on my Bald Eagle Jordan Lake eBook from today through July 4th. Celebrate our country’s birthday by learning interesting details about its National Symbol, the American Bald Eagle. Book has excellent primer on identifying the ages of bald eagles (they don’t all have the white head and tail). There are lots of stories of how I learned what it takes to be an eagle. Laughs, gasps, long looks and an awareness of why eagles do what they do. Book has 74 original photos (never published before) and 144 pages. Available for Kindle Fire, Apple iPad, Android devices, Mac or PC computers. 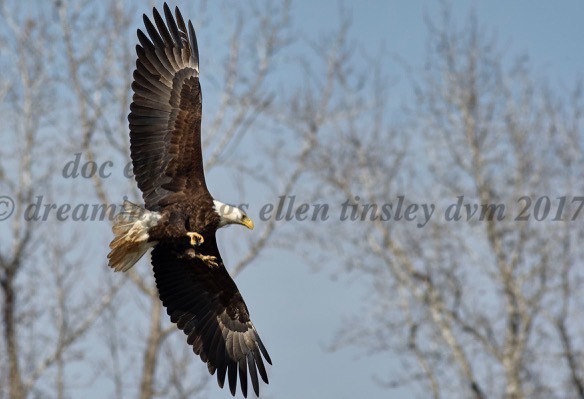 Posted in birds, Eagles of Jordan Lake, eBooks, Jordan Lake, Jordan Lake State Park, photography, wild birds and tagged as American bald eagle, bald eagle, bald eagles of Jordan Lake, doc ellen, eagle, eagles of Jordan Lake, eBook, Jordan Lake, Jordan Lake State Park, nature eBook, raptor, wildlife photography.